Thanksgiving calculator estimates the amount of food needed for your Thanksgiving dinner and suggests how to burn those extra calories. Thanksgiving is coming shortly to millions of houses in North America but also many around the world. While the family gathering itself lasts only for several hours, for many of us preparations start days or even weeks ahead. After all, someone needs to plan the meals, figure out the needed supplies and hunt down the precious turkey (along with dozens of other products). In an effort to help you calculate the needed supplies, we're bringing you this simple tool. You can also check out our Thanksgiving Calories Calculator to find out what you have to do to burn all those Thanksgiving calories. 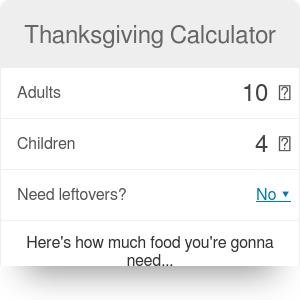 Also our grams to cups calculator may be useful during Thanksgiving meal preparation. In order to get you the most accurate numbers and proportions, we used the infographics prepared by Popsugar.com. We spiced them up a little bit by letting you consider also kid meals. For the purpose of calculations our tool assumes kids eat half of the adult meal and drink no wine (let's keep it this way ;-)). If your kids are soon-to-be-adults, you might as well include them as adults already to make sure you won't run out of food in the middle of dinner. Second addition involves turkey leftovers, who doesn't love having some for the day after. If you choose you're one of them, the tool will automatically count 30% more turkey to be purchased while keeping the other supplies unchanged. Please note that all numbers are very approximate. Exact amounts will of course depend on your individual appetites so just in case you might want to get some extra ingredients. Last but not least, if you want to keep fit, you might want to check how fast you can burn those extra pounds. There are various estimations on how many calories Thanksgiving dinner might have. Some sources state over 4500, some circle around 2500 while some claim the numbers are well below 2000 for most. We leave it up to you to decide. Once you have this number or you use the default one we provided, type in your weight and choose the activity type you prefer. The calculator will quickly tell you the time needed to burn your newly-acquired calories. Have a great dinner! Thanksgiving can be embedded on your website to enrich the content you wrote and make it easier for your visitors to understand your message.